Adelaide - Nervous South African all-rounder Faf du Plessis was jeered by the Australian crowd as he tripped his way down the stairs and onto the pitch for his Test batting debut. But he returned to the dressing room a hero on Saturday having helped his team claw their way back in the second Adelaide Test against Australia, hitting 78 off 159 balls with 13 fours and six. His 93-run eighth wicket stand with the injured Jacques Kallis got the Proteas past the follow on, pushing the team's first innings total to 388. And the team now have an outside chance of winning the Test after hitting back late on the third day, with Australia 111/5, 273 runs ahead with two days left for a result. Du Plessis was far from serene as he attempted to make his way through the Adelaide crowd and on to the ground with his team at 233/4. "I was very nervous before I went out," he told reporters after the day's play. Du Plessis had to wait several minutes while a review decided the fate of skipper Graeme Smith, who was eventually given out caught behind for 122. "I was just sitting there waiting to go into bat, because Graeme got the review, so it takes a couple of minutes while you sit there, you don't know if you're going in," he said. "Then I had an absolute shocker going down the stairs. My boot clipped one of the stairs and my whole foot came out. "I had to kneel in front of the whole crowd there, while they were abusing me from both sides. "My shoelaces were tied and my pad was in the way, so I couldn't get my foot back in. So I was thinking, 'I'm going to get timed out here.'" 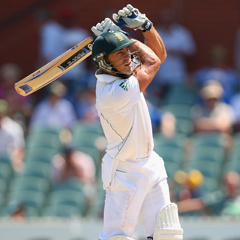 Du Plessis said the home crowd revelled in his discomfort. "I thought 'I'm just going to have run on like this and I'll sort it out when I get there.' Then my first step, I hit another step and almost tripped. The crowd was having a great time. "When I got in, I thought, 'it can't go worse than that'." But when he returned to the team dressing room as the last man out 205 minutes later, Du Plessis said the crowd "were much, much better" towards him.